Monday May 2nd 1921 I sent my machine away to be fixed this morning. I helped Hattie some with the work. Emma is sewing on a dress for her today. I was over at Dunlaps to a childs party for a little while. I had a letter from Lizzie Lindley. I wrote to her before supper. After I cleaned up the sewing room. Wrote to Birdie and read a book till ten oclock. weather cool. Tuesday May 3rd 1921 Emma only staid till noon. The girls went to a luncheon. Rob was late to his dinner. I did up the work, cleaned the sewing room, and sewed some on my machine. Mr Hughes brought it back. A letter from Lydia with one enclosed from Cousin Jen. I wrote Lydia. 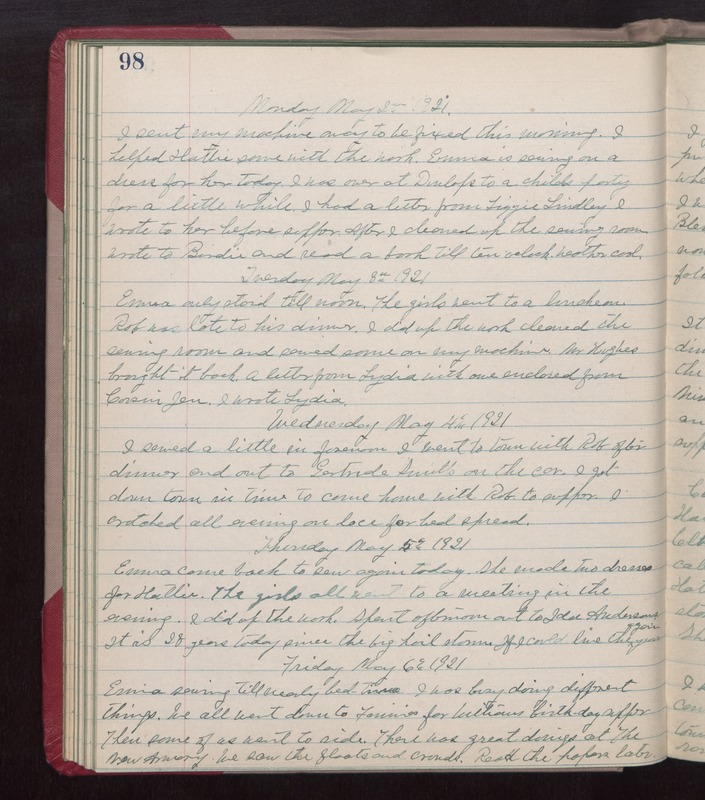 Wednesday May 4th 1921 I sewed a little in forenoon. I went to town with Rob after dinner and out to Gertrude Smiths on the car. I got down town in time to come home with Rob to supper. I crotcheted all evening on lace for bed spread. Thursday May 5th 1921 Emma came back to sew again today. She made two dresses for Hattie. The girls all went to a meeting in the evening. I did up the work. Spent afternoon out to Ida Andersons. It is 28 years today since the big hail storm. If I could live the year again. Friday May 6th 1921 Emma sewing till nearly bed-time. I was busy doing different things. We all went down to Fannies for Williams birthday supper. Then some of us went to ride. There was great doings at The New Armory. We saw the floats and crowds. Read the papers later.